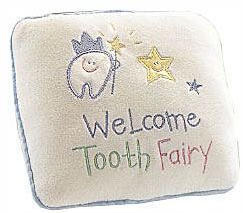 Tooth Fairy Pillow - Velour with emboidered accents. Small pocket on back holds child's tooth. Buy 1 for $4.99Buy 2 / Save $0.27!Buy 3 / Save $1.00! Size (inches): 6.50" X 5.51" X 2.36"
This is very cute for a little one losing teeth. Fabric Door Hanger - Pink - 8 1/2 x 5 1/2"